Martin Shkreli, the damp stack of Saltines who positioned himself into brief fame as the most hated man in America, was ordered by a judge to part with “Once Upon a Time in Shaolin,” the one-of-a-kind Wu-Tang Clan album he bought for $2 million. The mind strains to imagine a less sympathetic comeuppance. 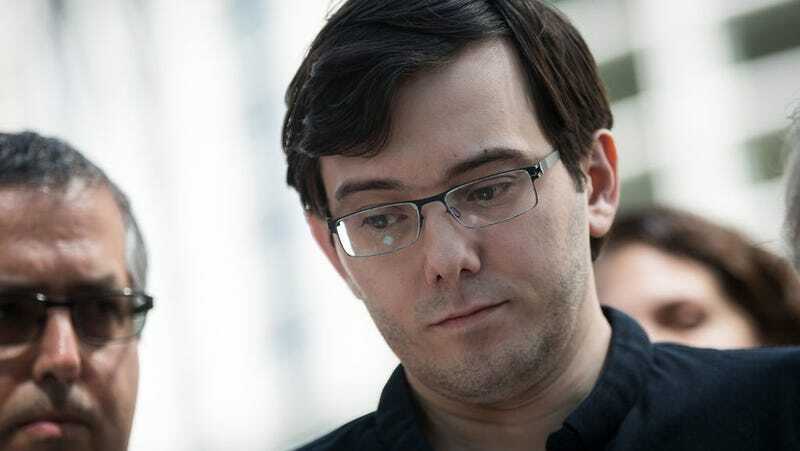 For those following the protracted saga of the pharmaceutical price-gouger, domain squatter, internet harasser, and, I guess, rap fan, Shkreli made headlines as a mid-rate troll who happened to be overcharging for AIDS medication and was later convicted of engaging in a not-so-elaborate fraud scheme. Prior to his just deserts, Shkreli made a habit of flaunting his ill-gotten wealth through the acquisition of, among other things, “Once Upon a Time in Shaolin”—a record which only exists as a single vinyl record. Among other possessions Judge Kiyo Matsumoto ordered Shrkeli to part with is a copy of the Lil Wayne’s unreleased “Tha Carter V,” which apocryphally he acquired after Wayne accidentally left a CD of the anticipated album inside a Bugatti he later sold. In all, Shkreli is being forced to forfeit $7.36 million. Really, it couldn’t have happened to a nicer guy.